Before we started weaning, I bought a few books to help us through it as I found all the information online a bit overwhelming! 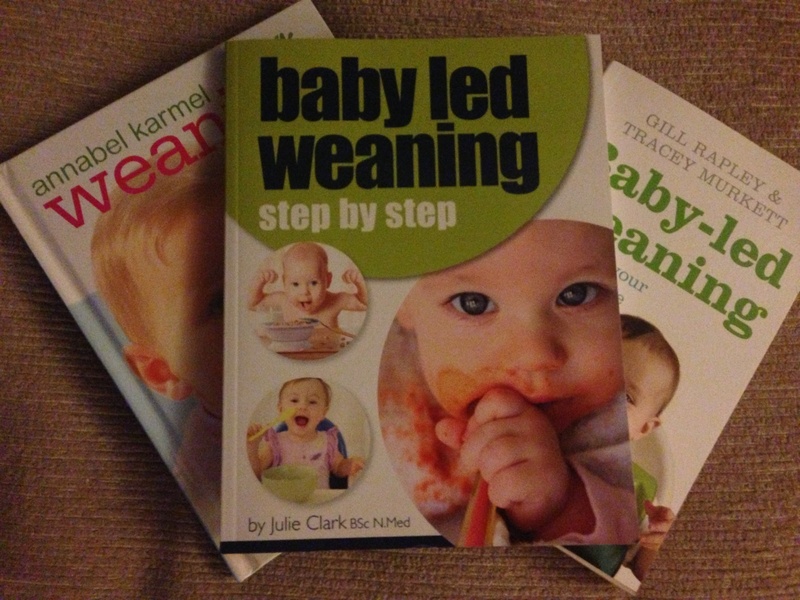 We wanted to try baby-led weaning so we bought a book by Gill Rapley as a lot of peers named her as a guru. In case this route didn’t work, we’d need to try purees so I bought a book by Annabel Karmel who is known as the queen of weaning through puree recipes! While buying these, Amazon also recommended ‘Baby-led weaning, step-by-step’ by Julie Clarke, and this ended up being the most useful book of the lot! I found Rapley’s book very theoretical – one big, long advert on why you should do baby-led weaning (the most useful bit being lots of quotes from parents who had gone through it). But I’d already decided we wanted to do weaning the baby-led way, so I wanted something more practical on what foods to try and when etc. The chapters are split by the age of the baby, but obviously not all babies are the same and they might not follow these months religiously! Like with everything, I tend to read and then do things my own way – so for example, the book recommends starting straight away on 3 meals a day, but we wanted to start with 1 meal a day initially (check out our first weaning update) – so I’d recommend you use this book as a guide to suit you, not a rule book! We’re also doing a bit of spoon-feeding (or guiding the spoon in the right direction) and initially tried a bit of baby-specific food like baby rice – the book recommends against this but isn’t judgemental about it – again, do what suits you! That’s all I can really say about the book without giving away all the tips! The only thing I would have liked a bit more info on is gagging – it does mention it, but it would be good to know a bit more about what to expect when it happens, I’m not sure exactly what I was after but it was definitely the thing I was most nervous about when starting our weaning journey! Co-incidentally, I’ve ended up chatting to the author on Twitter and I will be interviewing her for the blog about all-things-baby-led-weaning! So if you have a question for Julie, please leave it in the comments section below by Dec 1st (2014!) and I’ll give you a mention when the interview goes live early December! Pregnancy books – the best 5! 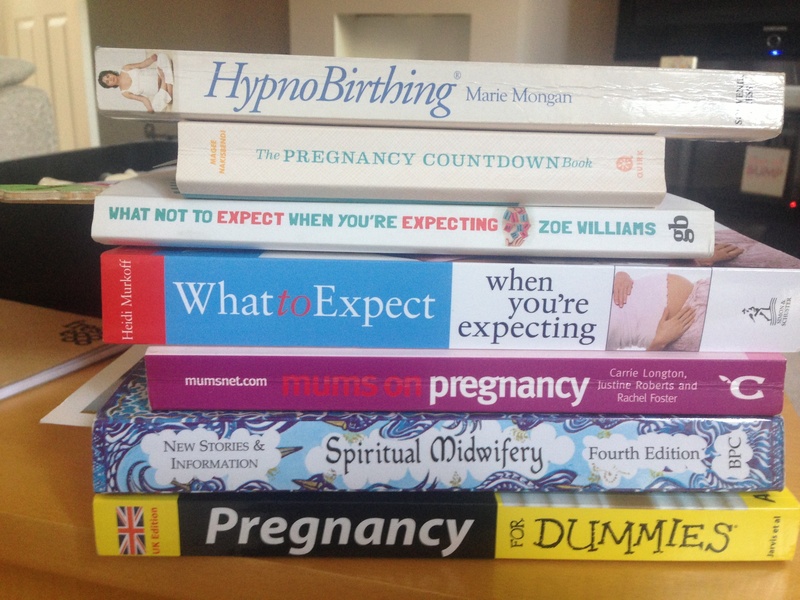 5 favourite books about pregnancy that helped to relax me! #1 – ‘The pregnancy countdown book’ by Susan Magee with Kara Nakisbendi, M.D. I love all the weekly update books and email lists (I signed up for loads including NHS, Netmums, Mothercare etc) – it was always good fun to see how big baby was compared to various fruits and veg, and what was coming up in terms of baby’s development and my body! This is a funny, great read – an antidote to all the books about what you should and shouldn’t be doing and feeling. At times I found pregnancy to be one long worry e.g. from one scan to the next. Reads like this helped to relax me – Zoe takes a lot of pressure off mums-to-be and new mums on topics from alcohol (devoting a chapter to proving that there’s no proof that a couple of drinks does any harm) to the pressures to breastfeed. So an essential read if you’re interested in natural birth – reading it relaxes me and inspires me. I’m not aiming for a hypnobirth – I haven’t been on a course/ bought the CD/practised anything from this book but again it was really useful reading when it came to thinking about a pain-free, natural birth. Critics of this book argue that there’s no such thing a pain-free labour, I have no idea as I haven’t been through it but, similarly to book #4 this book has lots of practical exercises on how to relax in the early stages – which has to be worth a shot! Author yummybloggerPosted on April 28, 2014 Categories books, pregnancy, reviewsTags books, childbirth, labour, pregnancy, pregnancy books, Zoe Williams9 Comments on Pregnancy books – the best 5!